That’s right, FERC found that exporting fracked methane for the profit of a few fossil fuel and utility company executives and stockholders is in the “public interest”, presumably including all the public whose water supplies are destroyed by fracking, whose fields, forests, and wetlands are invaded by eminent domain for pipelines, and whose taxes go up to pay for leaks and explosions, while the domestic price of natural gas goes up because foreign buyers will pay five times as much. 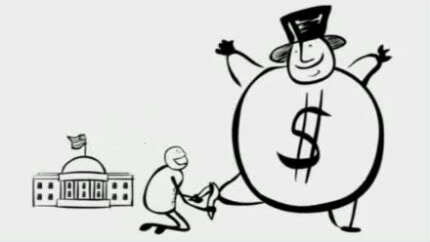 Actually doing something might include passing a legally binding ordinance, local and state agencies denying permits, landowners refusing access, countersuing, and getting governors and Congress members to speak and act against fossil fuel fracking, pipelines, and LNG export, instead of taking campaign contributions from that industry. 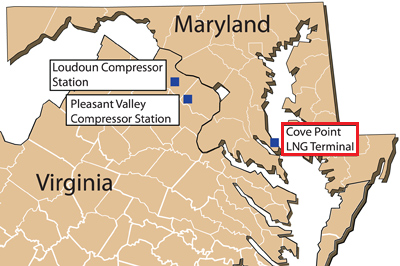 The Federal Energy Regulatory Commission (FERC) today authorized Dominion Cove Point LNG, LP to build the Cove Point Liquefaction Project in Calvert County, Maryland, and related facilities at an existing compressor station and at metering and regulating sites in Virginia. Today’s action came after more than two years of consideration of Dominion’s proposal during which FERC heard from more than 140 speakers at three public meetings related to the Environmental Assessment and received more than 650 comments from the public and federal, state and local agencies on the application. The project will enable Dominion to transport up to 860,000 dekatherms per day of natural gas form existing pipeline interconnects near the west end of the Cove Point Pipeline to the Cove Point terminal for the export of up to 5.75 metric tons of liquefied natural gas per year. The Commission found that the proposal, as mitigated with 79 conditions found in Appendix B of today’s order, is in the public interest. Maryland residents opposed Cove Point LNG just like Florida, Georgia, and Alabama residents now oppose the Sabal Trail pipeline. They still do, see for example Chesapeake Climate Action Network. But talk and meetings weren’t enough. Dominion Cove Point proposes to complete construction of the Liquefaction Project so that facilities may start service in June 2017. Construction of the related Virginia facilities would begin in 2016 and would be placed in service by March 2017. The U.S. Department of Energy has approved Dominion Cove Point’s export of gas to both Free Trade Agreement and non-Free Trade Agreement countries. That Office of Fossil Energy (FE) non-FTA approval happened 25 September 2013. FERC has approved three other LNG export projects, all in the Gulf of Mexico: the Sabine Pass Liquefaction Project, the Freeport LNG Project, and the Cameron LNG Project. Fourteen LNG export proposals are pending. 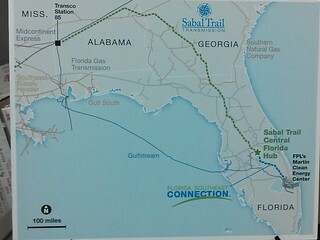 FERC neglected to mention the three LNG export operations FE already authorized in Florida, right at the end of the Transco -> Sabal Trail -> FSC pipeline chain. Under Section 3 of the Natural Gas Act FERC authorizes the siting and construction of onshore and near-shore LNG import or export facilities. Section 7 of the Natural Gas Act authorizes FERC to issue certificates of public convenience and necessity for LNG facilities engaged in interstate natural gas transportation by pipeline. As required by the National Environmental Policy Act, FERC prepares environmental assessments or impact statements for proposed LNG facilities under its jurisdiction. Here’s FERC’s PR for the EIA for Cove Point, 15 May 2014, FERC issues Environmental Assessment on the Cove Point Liquefaction Project (Docket No. CP13-113-000), and the actual EIA. This is what all of Sabal Trail’s promises are going to boil down to: a nice fat PDF with marketing platitudes “responding” to all the speakers in all the meetings, and then FERC’s Commissioners will rubberstamp the Sabal Trail pipeline. Supporting the pipeline proposal as it stands amounts to surrendering our future to the petroleum industry. Will the public and elected and appointed officials just keep talking and surrender our lands, our air, our water, and our future to the fossil fuel industry? Or will we and they actually do something?